Todd went to work, so Fuzz and I stayed home and finished chores, one of which was to make the pumpkin pie with condensed milk. We took the pie out of the oven right as the housekeepers arrived. They said it was “muy bonita”. Speaking of which, here’s Fuzz with the pumpkin pie. If you look closely, you can see where she stuck her finger in it. We’re working on impulse control, but who can blame her? The pie was very good. Bake for 15 minutes. Reduce oven temperature to 350°F; bake an additional 35 to 40 minutes or until knife inserted 1-inch from crust comes out clean. My pumpkin pie has a fingerprint too-from me. I’m still working on impulse control for me, but it’s way on the bottom of the list. Happy Thanksgiving! Great Pie Anna! Have a wonderful thanksgiving! 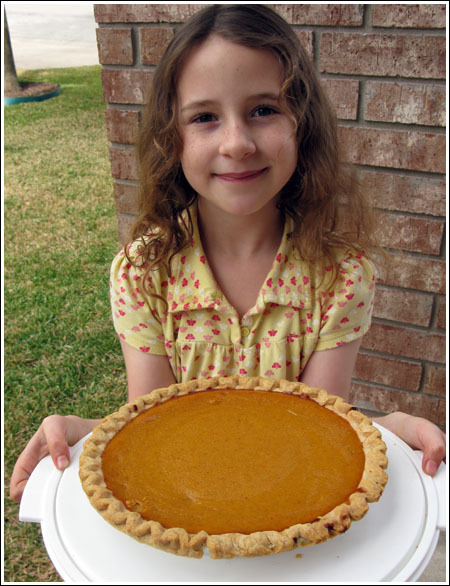 beautiful girl and adorable pie! LOL the impulse control comment is so funny. What a beautiful pie–don’t think of it as a fingerprint, but a charming ‘dimple’ like in Shirley Temple’s cheek! Happy Thanksgiving Anna, and I’m very thankful to you to have gotten me to start baking this year, even if it’s only chocolate chip cookies, peanut butter cookies, brownies, and bar cookies thus far. Hey, from nothing to that ain’t bad, actually! I’m very inspired by your blog! Happy Thanksgiving – Your recipe is the one that I have downstairs ready to make – I am glad that you just reinforced my recipe choice decision!! Oh your pumpkin pie looks grande! Being that I am the queen of impulsive…it takes years to overcome! There is something about the aroma of pumpkin pie baking…you just want to have a slice of that pie before it cools! You go Fuzz! Enjoy the movie! Have a wonderful Thanksgiving one and all! “Muy bonita” indeed! Great job Fuzz, I would have done the same thing pocking my finger! Happy Thanksgiving Anna!!! Beautiful pie! I made one today, too but my crust shrunk. I have no idea why this happens, but your crust looks absolutely perfect. Thanks for all the great recipes. I have enjoyed your blog very much! I would probably stick my finger in the pie, too. The heck with impulse control. My you, Todd, Fuzz and Lizzie have a Happy Thanksgiving. Have a lovely, Thanksgiving, Anna! Impulse control is highly over-rated. What a wonderful looking pie! Looks great, I need to get to work. I think all pies should have one finger print in them! Adds a lot of character, you know.